“When you’ve seen one microgrid, you’ve seen one microgrid." This saying exists for a reason: The one thing everyone does agree on is that there’s not necessarily a “standard microgrid." By definition, each project is designed and engineered to meet a specific customer’s set of requirements. That customer base includes a growing number of colleges and universities attracted by the ability to generate their own power needs, among other benefits offered by the self-contained systems. 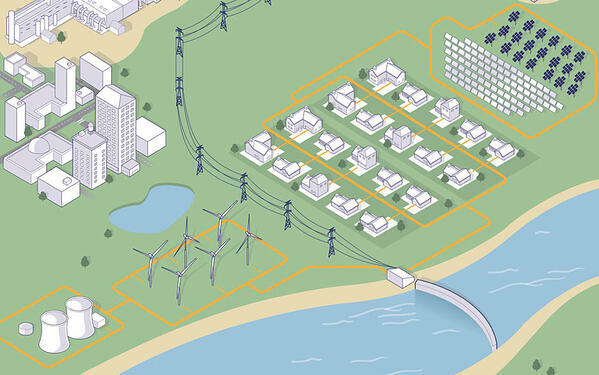 So, What Is A Microgrid? Essentially, these energy systems are capable of balancing captive supply and demand resources to maintain stable service within a defined boundary. Infographic via the Microgrid Institute. A recent report from the Environment America Research & Policy Center revealed that microgrids are becoming increasingly common on college campuses. The report also gives insight into why institutions are such excellent candidates to develop microgrids: their already self-contained nature, long-term investors, 24/7 energy needs, and abundant space available (rooftops, parking lots, etc.) are just a few that top the list. Michael Burr, Founder and Director of the Microgrid Institute, explained that due to his former job as editor of a utilities magazine, he’s had a pulse on the concept for decades. Concerned by the prospect of a battle over the political questions, Burr set out to create an organization focused on charting the path forward. The Microgrid Institute was born. Burr shared that the increasing number of campuses pursuing microgrids is spurred by research and development that has led microgrids to a point of relatively mature technology. 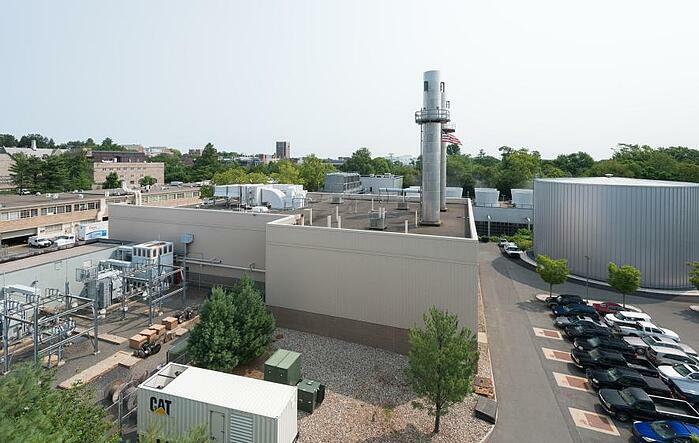 Princeton's cogeneration plant (Photo via Christopher Lillja). He believes this rising star is also a matter of tech proliferation. “By nature, universities are interested in learning about technologies, so it’s logical that many are interested in microgrids as an energy system not just to meet their needs but also showcase their commitment to innovation,” he said. Resiliency is another huge draw for universities, especially in the wake of Hurricane Sandy in 2012, and most recently, the devastation from Harvey, Irma, and Maria. Brief brownouts, let alone blackouts, are highly detrimental in the event of extreme weather, where universities are looked upon to be strongholds for the community. The threat of cyber attacks is yet another push. The ability to operate independently from the central power grid is invaluable in the face of disaster, as proved by Princeton’s resilient response while half a million people lost power during Superstorm Sandy. Confusion also persists on what a microgrid is not; a community solar garden, for one, or solely a backup generator. The overriding concern for universities, unsurprisingly, is cost. The value of a microgrid isn’t always easy to calculate in dollars and cents--which is why it’s essential to look at objectives, and the most cost-effective way of meeting those. While there are a couple of ways that microgrids reduce a university’s carbon footprint, it’s important to note that they're not synonymous with clean power. 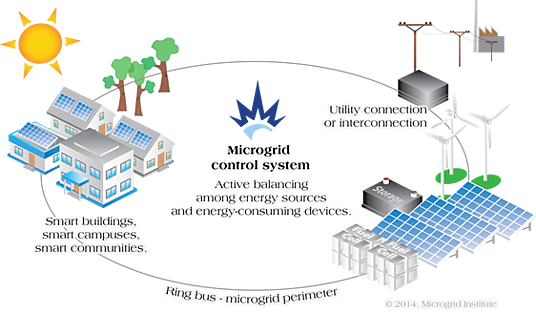 By definition, microgrids are a control system, not an environmental one. However, by incorporating renewable sources of energy locally, many universities are using microgrids to meet their sustainability goals. “The design process involves looking at energy usage, and in the process you find ways to gain better control of it, which means shifting loads to when they can be served by renewables, modulating loads to manage short-term peaks, shifting to a different time of day and reducing the use of ‘dirty energy,’” Burr explained. 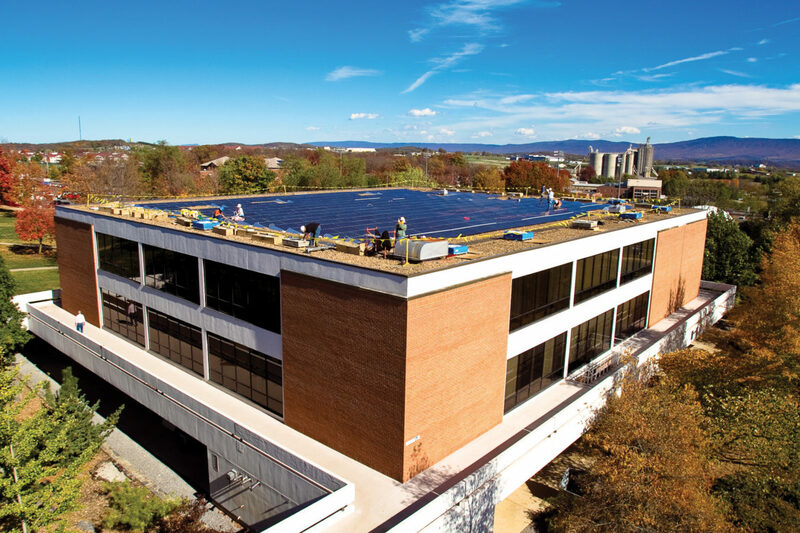 Eastern Mennonite University, a private liberal arts university in the Shenandoah Valley, is in the final stages of installing their microgrid, which will be able to power the school’s 650,000 sq. feet of buildings upon completion in early 2018. The microgrid will consist of three, 500-kilowatt natural-gas-fired generators, enabling EMU to provide for their own power needs if need be (with the help of a solar panel array located on top of the campus library). Director of Facilities Ed Lehman explained that their interest stemmed from significantly lowered distribution demand charges and long-term value. Plus, they benefit from lower power demand when the local utility is experiencing significant demand. Lehman projects that the microgrid will save about $7.00 per kW on the distribution demand fee. The decision came from a combination of recommendations and economics, after entering into a performance contract with Siemens Building Technologies to work on energy-saving capital improvement measures. Siemens completed a study for the university looking at their peak times and dates as well as the peaks for the local utility. In a year’s time, there were only two days when the peaks were coincident--meaning that the rest of the year, the monthly peaks were different. Lehman stressed the value of conversations with the utility both early and often in order to have a solid understanding of their needs. He said that it’s equally essential to be familiar with your internal needs. “You must have a good grasp on your own needs to keep your load profile and minimize costs to see what’s most beneficial,” he said. When it comes to coughing up the dough for microgrids, there are several different financing mechanisms. Unlike net-metered energy systems, where it’s a straightforward mechanism and therefore easier to make a business case, microgrids require you to put a standard dollar on resiliency--which isn’t an easy task. “What we’ve seen is a lot of work to put dollar figures on what resiliency is worth, to value the ability to withstand a large utility outage. It has to do with the cost of an outage,” Burr said. For some industries, this is a no-brainer. For instance, in a hospital or nursing home, the stakes are life-and-death. When it comes to higher ed, each university has different needs when it comes to resiliency. “Each university has to think about where they need resilient power on their campus and why that’s so valuable, and it might be an entire island microgrid," he said. There’s also a big difference between a microgrid owned and operated by a utility and by an energy user. The utility can justify the costs it incurs for serving customers and can fund some microgrid investments as part of its rate base. This is less likely to happen in a college campus scenario, where it’s more probable that the institution or a third-party private vendor owns and operates the microgrid. 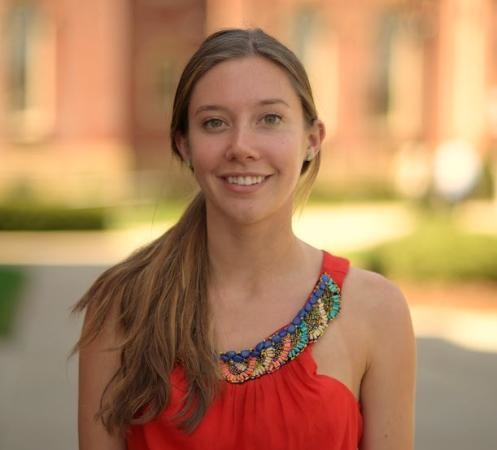 Burr believes that public-private partnerships can be an excellent way to finance microgrids, and the P3 approach can help communities and colleges work together on complementary goals. A microgrid can be part of a community-wide strategy to improve resiliency and public infrastructure, reduce carbon footprint, and save money. At the end of the day, Burr believes a broad-based P3 approach, with a focus on stakeholder engagement and disciplined management, is most likely to yield the best possible outcomes for any community. Indeed, with the help of microgrids, tech-savvy schools across the nation are paving the way toward a more resilient future. Want to learn more about innovative approaches and solutions for higher ed facilities? Join us at HEFF '19!